Twenty-seven projects from school districts across the state were awarded 2018 Stars of Distinction in six categories — community, planning, transformation, design, value, and sustainability. Milby was awarded six out of six stars. This entry was posted in 2012 bond, 21st century schools, Business Operations, District III - Sergio Lira, Green Building, High Schools, New schools, News and tagged 2012 bond, Milby HS on September 26, 2018 by HISD Communications. Work has begun at Mitchell Elementary School, where abatement is underway, and demolition is soon to start. Mitchell’s $23 million facility will accommodate about 750 students. The two-story 91,300-square-foot-building will feature open, brightly colored learning spaces, large windows, abundant natural light, and extended learning spaces throughout the building for individual and group collaboration. This entry was posted in 2012 bond, 21st century schools, Building Updates, District III - Sergio Lira and tagged 2012 bond, 2012bond, bond 2012, Mitchell Elementary, Mitchell ES on June 21, 2018 by HISD Communications. 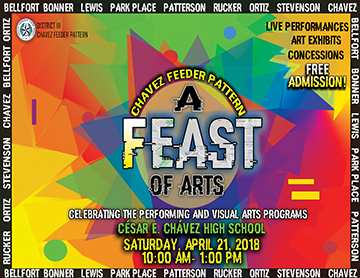 The second annual Feast of Arts for schools in the Chavez feeder pattern will take place from 10 a.m. to 1 p.m. on Saturday, April 21, at Chavez High School (8501 Howard, Houston, 77017). This entry was posted in District III - Sergio Lira, Fine arts, HISD: Our Story, News, Special events on April 17, 2018 by HISD Communications.